Other teachers and members of the larger society perceived many of the students in our classes as functionally illiterate and lacking in intellect. These detractors relied on traditional school-based measures (past school performance, test scores) to support their claims and their resultant behavior toward (more like against) these youth. These assessments, however, ran counter to our observations of our students’ sophisticated literacy practices that accompanied their participation in hip-hop culture. The same students portrayed as uninterested in literacy would come into our classrooms capable of reciting from memory the lyrics of entire rap albums. They voraciously read popular hip-hop magazines and transcribed song lyrics, and several carried their own rap composition books. Even those students who were not so deeply involved with hip hop culture regularly listened to popular radio stations that programmed predominantly hip-hop and accessed magazines and CDs. To tap into this literacy rich youth cultural activity, we developed a seven week poetry Unit that paired hip-hop texts with canonical works of poetry. The goal of the unit was to play on students’ heavy investments in hip-hop to create deeper understandings of school-based forms of poetry. We aimed to help students see the timelessness of the literary themes present in both canonical texts that they were mostly unfamiliar with and some of the music they listened to daily. We made explicit the fact that the literacy skills and knowledge that they exhibited in their interactions with hip-hop texts were not far removed from the skills required to succeed in analysis of poetry. In addition to preparing the group presentation, each student was expected to prepare an analysis of the other seven poem/song pairings to participate in class discussions. We had worked hard all year on developing a classroom culture where student participation in dialogues about literary themes was normalized. 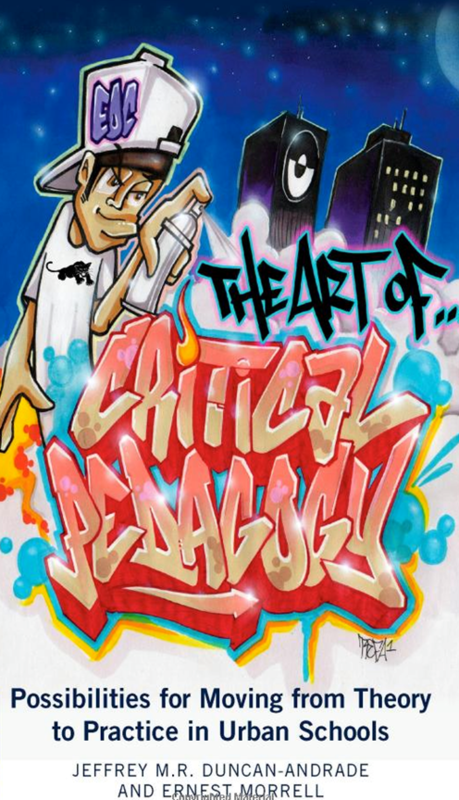 This, along with the use of hip-hop texts that drew students’ attention, made the prospect of out-of-class preparation more likely, as the class came to enjoy challenging and broadening the literary analysis of their peers. For the first two weeks of the unit, we spent class time going over poetic forms (sonnet, haiku, free form, prose) and poetic devices (rhythm, rhyme, meter, imagery, word choice, theme). We used examples from the eight pairings to teach these concepts, discussing with students their presence in music and traditional poetry. Students were also encouraged to bring passages from favorite songs or poems that displayed the ideas we were learning. During this time, students also began developing their poetry portfolios, writing poems that employed the concepts and forms that were discussed. During the second two weeks of the unit, students continued developing their own poems while they worked in class with their groups and the teacher, preparing the analysis and presentation of their assigned pair. Class time was split between sharing and receiving feedback on their poems among peers and on preparing for their upcoming class presentations. During the fifth and sixth weeks of the unit, each group was assigned one day to present its analysis and to lead the class in discussion about its pair. Presentations ranged from traditional stand-and-deliver approaches to more creative approaches where students brought in music videos and film clips or utilized interactive activities. The remaining week-and-a-half was used for poetry readings. Each student was required to choose at least one poem to read in front of the class. These were often some of the most personally revealing and moving moments in the class. Putting the unit toward the end of the school year afforded many students the comfort level to risk sharing poems that revealed some of their most personal life experiences.